Congratulations to Pat Griffin on winning the Barnes Jewellers Fermoy Golfer of the Year 2018. Congratulations to Sean O’Brien and Gavin Walsh who won the club fourball final, defeating defending champions Niall Cotter and Eoin McCarthy 1up on the 18th Hole. A fitting end to a great championship. The John Whyte Memorial Senior Scratch Cup took place on Sunday September 16th, with a bumper prize fund of €1,000. 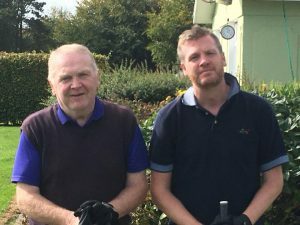 In another competitive renewal of the prestigious competition, current Irish international James Sugrue from Mallow won for the second time with a one-under-par total of 69. It was a great effort from the plus 4 handicap player as he had only returned from Home International duty for Ireland in North Wales the previous day. James joins previous multiple winners include European Seniors star Denis O’Sullivan and Fermoy native Tom Cleary. Munster interprovincial player Cathal Butler, from Kinsale, was second with a level-par 70, with Mark Ford from Cork in third place, also with a 70. Home player Ray Hurley won the best nett, on 69. Looking forward to a great renewal next year. The ILGU are celebrating 125 yrs and are offering clubs a complimentary ladies team entry to a celebration day in Killeen, Killarney on Oct 11th 2018. Though Clubs may choose a team at random, we are running a qualifier in conjunction with Ladies Hon Sec Trophy on Mon 3rd of Sept. Further details will be on notice board.